Dr. Thomas L. Simmer oversees Blue Cross Blue Shield of Michigan’s medical policy, professional payment policies and national programs to improve quality, cost and access to medical services. He graduated from Wayne State University’s School of Medicine and earned his bachelor’s degree from the University of Michigan. Dr. Simmer is responsible for reimbursement to more than 25,000 physicians throughout Michigan. Under his leadership, Blue Cross introduced physician incentive programs to promote cost-effective ways to prescribe drugs and to provide consistent care for people with chronic illness. Dr. Simmer also provides leadership to the Michigan Quality Improvement Consortium (MQIC), which works with health plan medical directors across Michigan to create and put evidence-based guidelines into use. Prior to joining Blue Cross, Dr. Simmer served as vice president of Health and Medical Affairs for Health Alliance Plan. 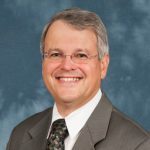 He also served as associate program director for the Internal Medicine Residency Program at Henry Ford Hospital and was the recipient of several Distinguished Service Awards. In 2010, Crain’s Detroit Business honored Dr. Simmer with a Healthcare Hero award. It recognized his work promoting health care transformation in Michigan through the Patient-Centered Medical Home initiative and other collaborative programs with doctors and hospitals throughout the state. He’s a member of the American Medical Association, Michigan State Medical Society and a Fellow of the American College of Physicians.